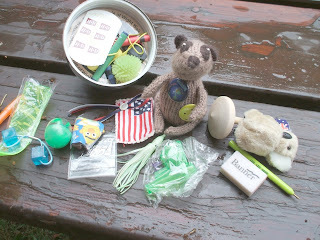 We took our oldest son and his girlfriend for their first geocache expedition while we were on the Isle of Wight. This one at Fort Victoria was in the most fabulous (and reflective!) container. I was really pleased because it was 4th July, and one of the items in the cache stash was a textile badge in the shape of the American flag. I am SO glad you had this as your blog. 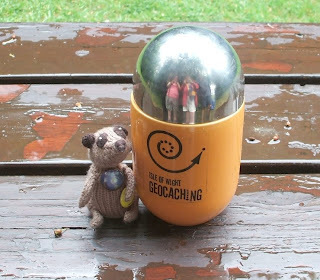 My daughters and I did our first geocach today. We are hooked! It's going to take a while to get the hang of it. I was thinking it would be cool to start a tag with the goal of finding you! I would need to figure out how to do that. The geocach we found today was called "The Big Apple." My geocach name is, Enuwbe. You Blog is FUN! I will visit again! 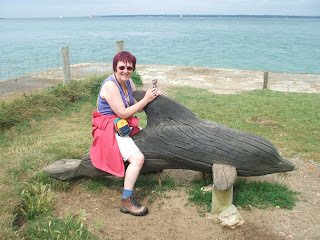 Cute on the dolphin! Looks like a beautiful get-away.